Being involved in or witnessing a road traffic collision can be stressful and upsetting. Especially if a person or animal is injured, see below for our advice on what to do if you witness or are involved in a collision or if you need to make a 999 call. Contact the authorities. For road traffic collisions the best practice is to ask for the ambulance service if anyone is injured and report it to the police as soon as possible. If anyone is injured you have a legal obligation to report the road traffic collision to the police. Gather witnesses information. Take contact details and if possible ask for a short statement. Exchange information with other parties involved in the collision. Keep the conversation simple, name, address, contact number, registration and the make and model of car. Make notes about which way you were heading on the road, your approximate speed, any obstructions, and the general road conditions. Avoid discussing this with the other driver. If you have been involved in a road traffic collision you must stop and stay at the scene for a reasonable period of time. If you don’t exchange details at the scene, you must report the accident at a police station or to a police officer as soon as you can and within 24 hours. Stay calm and keep yourself safe. If you are in a car when you approach an accident, park safely and turn off your engine. Don’t cause any more accidents make sure your hazed lights are on. Do not light cigarettes in case there is a petrol spillage. Do not use you mobile phone near the crash. If you are a competent first aid trained you may wish to assess the injuries and apply first aid to stabilise the casualties. If you do not have first aid skills then do not attempt to help the injured person, you could do more harm than good. Let the people involved know that help is on the way, try to keep them calm and talk to them and reassure them. On dialling 999 the operator will ask you which emergency service you require. For road traffic collisions the best practice is to ask for the police. The police operator will then inform the ambulance and fire and rescue service if they are required. The decisions the police operator come to will depend on the information you provide to them. If in doubt call all three services. 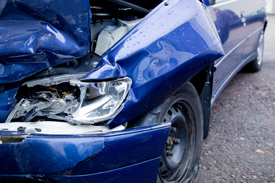 Do not rely on other witnesses to call in the collision. It is better for lots of people to call rather than no emergency call being made. Any points of reference e.g. towns, villages, shops, garages or public houses. This will help you describe your location to the emergency operator. Types of vehicles (cars, HGV, LGV, motorcyclists etc). How many people are injured. If anyone is trapped in vehicles. Don’t worry if you forget to tell the emergency operator any of the above as they will prompt you for the information they require. 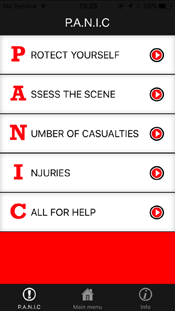 Listen to the any advice the emergency services operator may be able to give you. Make sure that you are prepared for an emergency situation! Learn2Live have developed a mobile phone app that is FREE for anyone to download to their smartphone.